Calling card of Gertrude Magoon. 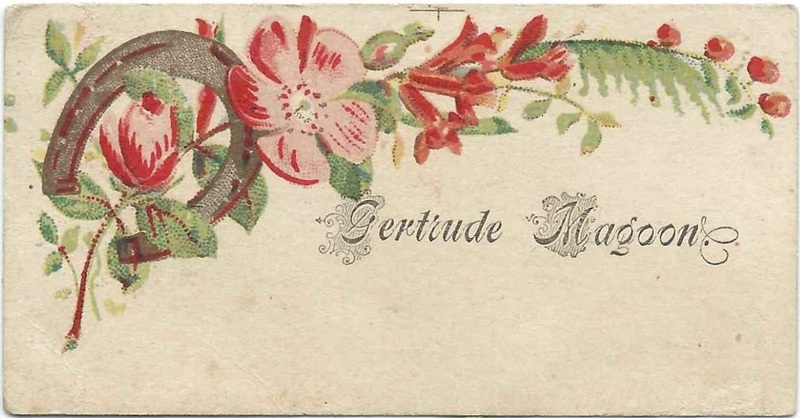 Because this card came with a collection of Maine calling cards, many of which belonged to people in Franklin, Somerset and Penobscot Counties of Maine, it's possible that this Gertrude Magoon was the Gertrude born at Harmony, Maine, in 1868. See another post that features an early 1900s archive of photographs associated with the family of Lewis Everett Carr and Maxine Eunice (Ring) Carr, "Jerry". Many of the photographs show older people, who might include Lewis's grandparents Charles Edward Carr and (Gertrude Magoon) Carr. Gertrude Magoon was born July 3, 1868 at Harmony, Maine, the daughter of Daniel S. Magoon and Nancy Adeline (Boston) Magoon. On April 6, 1887 at Dexter, Maine, Gertrude married Charles Edward Carr, son of George W. Carr, Sr., and Emeline (Wyman) Carr. Charles was born at Dexter, Maine, on November 23, 1862. Gertrude and Charles farmed at Dexter, Maine, and raised, I think, three children. Charles died in 1940 and Gertrude in 1955; they're buried in the Mount Pleasant Cemetery at Dexter, Maine.